Win: Next of Kin - Revisit the Aussie horror just in time for Halloween | SWITCH. Linda Stevens (Jacki Kerin), 24, has just inherited a big old house. An evil house. All night she hears a voice that whispers slowly from somewhere deep in the back of her mind. Taps turn themselves on and off. Candles light without a flame being put to them, And just last night she found the corpse of an old man in her bath. The house is called Montclare, and something evil lives there. The 'Next of Kin' competition has now closed. Winners will be announced shortly. Competition opens at 5pm AEST on Sunday 30th September 2018 and closes at 11:59pm AEDT on Sunday 7th October 2018. Five winners will be chosen at random on Monday 8th October 2018. To successfully win, entrants must fulfil the above entry conditions before the time the competition closes. Current members/followers are eligible to enter the competition. Only one entry per person. Only one winner per household. To be a valid winner, the entrant must not have won a prize from SWITCH within the last 28 days. 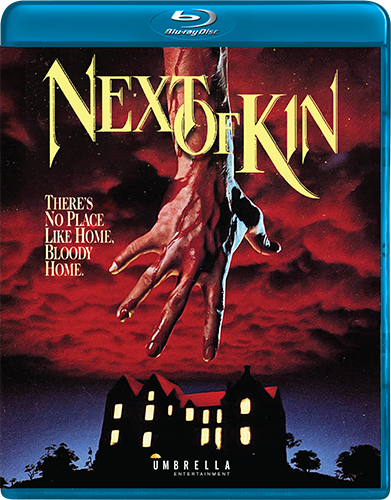 Each winner will receive one Blu-ray copy of 'Next of Kin'. By entering, you agree to receive occasional emails from SWITCH in the future. If you decide to unsubscribe from these updates, any further entries will not be applicable. Only Australian residents are eligible to enter. 'Next of Kin' is available on Blu-ray and DVD on Wednesday the 3rd October 2018 from Umbrella Entertainment.